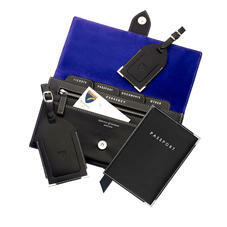 Receive Complimentary Personalisation of Initials on all Aspinal Travel Collections for men. The perfect travel accessory to your hand luggage, make sure you stay organised in style with our range of mens Travel Collections. Individually handmade in our workshops by our master leather craftsmen and available in Jewel Calf, English Bridle, Croc Calf or Lizard Print leather. Includes two stunning luggage tags: one large for suitcases and one small for carry on bags, an Aspinal deluxe passport cover featuring the Aspinal contrast ribbon marker and all lined in moire silk, and finally the Aspinal Classic Travel Wallet luxuriously lined in moire silk and contrasting plush soft-suede. 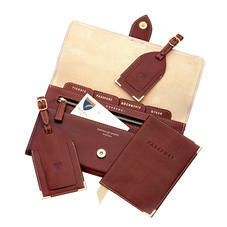 You can buy the items separately or save 20% when you purchase any of our complete Travel Collections for men.